As I mentioned in my previous article, you can assign a follower with a profession perk to your level 2 garrison buildings for an added bonus. One bonus is that you have a chance to get 2 extra resource from your work orders. The chance for getting an extra resource is only 50% if you have a level 90 follower, but it will increase to 100% when you level your follower to level 100. For the Mine and Herb garden, the bonus is that you will get 8 herb/ore from your work orders instead of 5. Alchemy - Alchemy Experiment daily quest, the reward is 5 random potions. Enchanting - Weapon enchant transmog for old enchants like Enchanter's Illusion - Mongoose. Herbalism - You can speak to your follower to select which herbs to grow every day instead of growing random herbs. Inscription - Your follower will let you create Draenor Merchant Order. This generates a random receipt, and if you make two of the same, you can fuse them together. This creates either a Merchant Order or Large Merchant Order which can be sold to a vendor for gold. Jewelcrafting - You get a random daily quest. The reward is Jewelcrafting Payment which contains around 200 gold. Leatherworking - You can craft a bunch of tents like Fine Blue and Gold Tent for 5 Raw Beast Hide. Skinning - You get more leather, fur, and feast from your work orders at the Barn. You need a level 2 building to assign a follower to your buildings. And to get the blueprints, you need to complete your Talador Outpost at Talador, or you need level 96. Rezlak (Horde) or Sparz Boltwist (Alliance) sells the blueprints at your garrison for 750 gold. Mine is the only exception because you can upgrade it at level 92 for 1000 gold. Once your building is level 2, you can assign a follower to that building if you select it at your architect table. A much easier way to get the followers is from questing. (and cheaper if you don't even have Lunarfall Inn / Frostwall Tavern). 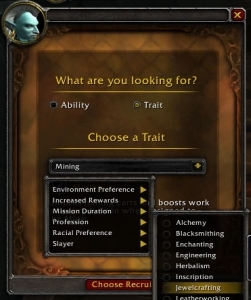 Most followers from quest rewards have random traits, so if you are lucky your follower can roll a profession trait. Below is a list of every quest/mission that rewards you a follower with a predefined profession trait. This information is from the beta, so it's possible not everything is accurate. Horde: Mulverick Find Guse at Frostfire Ridge and accept the quest Slavery and Strife from her. Find Mulverick and complete Mulverick's Plight, then he will ask you to allow him to repay his debt by serving under your command. Alliance: Bruma Swiftstone Reward from the first mission Killing The Corrupted you receive after completing the opening quest chain that starts your Garrison. Horde: Weaponsmith Na'Shra Find Initiate Na'Shra, accept the quest Smeltcraft, and Na'Shral will join your garrison after you complete it. Alliance: Rulkan Find Prophet Velen and accept the quest Chasing Shadows. You will get two more follow up quests and you will get Rulkan when you complete those. Both factions: Ahm Get Dying Wish quest from Ahm at Talador. Upon completing this quest, you will find the ghost of Ahm outside your Garrison. He gives the quest Solidarity in Death, which allows you to recruit him as a follower. Horde: Kimzee Pinchwhistle This follower is obtained from the quest chain starting from the Clutchpop Gearworks in Spires of Arak. Horde: Shadow Hunter Rala Find Rokhan and accept We Be Needin' Supplies. After you find Shadow Hunter Rala, complete the quests he and Shadow Hunter Mala offers and he will join your garrison. Alliance: Fiona Find Rangari Arepheon, accept and complete Blademoon Bloom. There will be one follow-up quest Gestating Genesaur, then Fion will offer to join your garrison. Horde: Benjamin Gibb Find Benjamin Gibb at Spires of Arak, then accept his quest and he will join you after you complete it. Alliance: Admiral Taylor Find Admiral Taylor at Spires of Arak, then accept his quest and he will join you after you complete it. Horde: Olin Umberhide Comes from a very early garrison quest Winds of Change right after you build your barracks. Alliance: Artificer Romuul Reward from Artificer Romuul. This quest is only available after starting a mini-event near Embaari Village at Shadowmoon Valley. Horde: Ka'la Reward from Gronnlings Abound mission. Usually it's one of the first few missions you get after you get your first follower. Alliance: Shelly Hamby Lost Lumberjacks in your garrison starts a questline to Gloomshade Grove eventually awarding Shelly. Both factions: Lantresor of the Blade Lantresor will offer to join your garrison after you have finished his questline in Hallvalor. For Alliance, he awaits outside Telaari Station after finishing up Challenge of the Masters. Horde players can find him waiting outside Wor'var after Challenge of the Masters. Both factions: Dark Ranger Velonara (H), Hulda Shadowblade (A) These followers (for Alliance and Horde) are obtained from Spires of Arak questline when you have built the Brewery to your outpost. The quest chain ends to Standing United (Alliance) / Standing United (Horde). Both factions: Goldmane the Skinner Kill Bolkar the Cruel and loot Goldmane's Cage Key. Release Goldmane the Skinner and he will join you. Both factions: Pleasure-Bot 8000 Reward from completing a quest from Torben Zapblast (Alliance) or Ziz Fizziks (Horde).